What about toll-roads. Can I get a Sun Pass for my rental car? Have you ever been breezing along a freeway and suddenly realized that you don't have the required change for the toll road ahead? Or, worse yet, you have change, but you're in an electronic only tolling area. 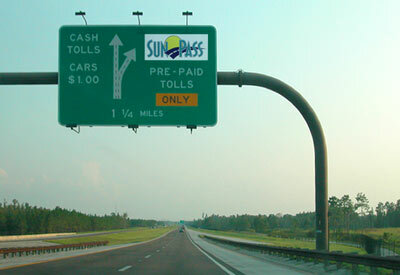 This can be frustrating to non-residents who are visiting Florida and don't have the necessary Sun Pass. As you'll read in the links above, all Florida rental car licenses are registered with their toll authority, so driving through a toll area without a pass will come back to haunt you. Please don't let the few cents saved in a fare cause you unnecessary expense and taint what otherwise would be, a lifetime of wonderful memories.